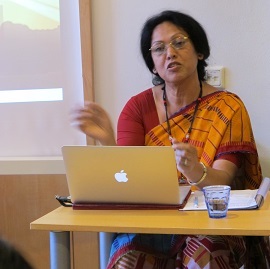 Forty leaders of the shelter and gender equality movement in Asia met in the Hague, the Netherlands on November 2-3, 2015, to discuss the status of women’s empowerment in the region. On the eve of the Third World Conference of Women’s Shelters on November 2, Asian delegates gathered at the Centrum Quadraat meeting room in the historic center of the Hague to discuss developments in shelter work in the region, progress toward building the economic capacity of survivors to find jobs and housing after they leave the shelters, and strategies to help migrant women and other marginalized groups be free of the fear of violence. Economic empowerment: Well-funded employment, housing and community programs to help women after they leave the shelter to become independent. Housing and land: Give women equal property rights, rights to inheritance, affordable housing for survivors of domestic violence, and guarantee the property rights of widows. Create an environment where victims are able to report violations, seek justice, and speak out about abuse without fear of a lifetime of isolation so they are able to fully reintegrate into society. Law reform and implementation: Update outdated laws, properly implement progressive laws, and improve coordination across borders to protect vulnerable women and girls and bring justice to survivors of GBV. The government should address the lack of accountability systems within the public institutions. 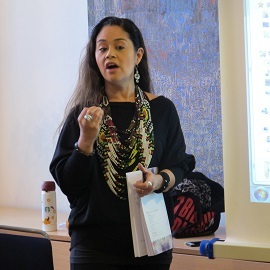 NGOs should collect data and case study stories to improve our services and make us more accountable, and to help make us more effective advocates for the human rights of women and girls. Full and equal protection of migrant women, especially domestic workers and marriage migrants. For disaster situations: Prepare for future disaster situations by making women part of the disaster relief process, and making the processes more accessible to women. The government should coordination between police, judiciary, hospitals other public institutions as well as civil society service providers to avoid need to re-apply, re-testify and re-live the trauma of abuse. The government should produce clear and published guidelines and protocols for public institutions to follow in cases of gender based violence. The chairperson of the Asian Network of Women’s Shelters, which organized the event, Chi Hui-Jung said Asia, as was the world’s most diverse region, could show the world how a strong network of different peoples can come together to help women and girls be free of violence and abuse. Ivy Josiah, Former Executive Director, WAO Malaysia talked about ethnic tensions in Malaysia and problems with husbands converting to Islam and taking domestic violence cases to the Sharia court. Ivy also stressed how important it was for NGOs to collect data for advocacy and fundraising, and also to improve accountability: “We need documented and data-evidence proof work to convince people,” Ivy said. 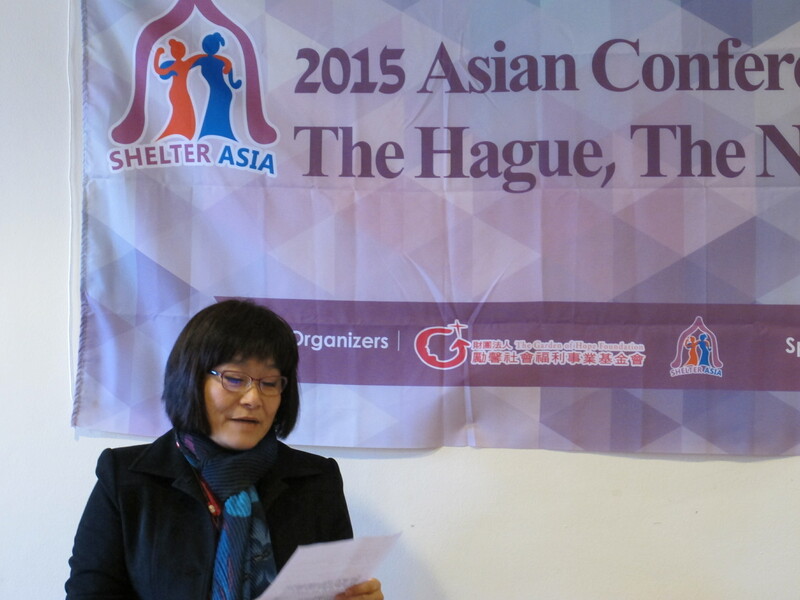 Chisato Kitanaka, Executive Director of the All Japan Women’s Shelter Network, presented the results of a comparative survey on Taiwan, Japan and Malaysia. She said Taiwan had the most complete shelter system, and was particularly impressed that social workers were employed in shelters in Taiwan, which is not possible in Japan. Housing and land rights was another important issue. “Safe living means a house, tenureship and property rights of women,” said Mashuda Shefali, Executive Director NUK Bangladesh. Lorraine Lim, Administrator and Counsellor the Star Shelter SCWO in Singapore said, “Many migrants do not know that domestic violence is a crime, let alone where to go to report it.” Her organization, the Singapore Council of Women’s Organisations (SCWO) recommends residency rights could be sponsored by a relative or friend and not just the spouse of a migrant. The ANWS board met during lunchtime and reported back to the conference in the afternoon, urging participants to sign up as members of ANWS on the website. On November 3, participants went on a study visit of the Hague city government and a local shelter for young pregnant women and mothers. The conference was sponsored by Taiwan’s Ministry of Foreign Affairs, and organized in partnership with the Garden of Hope Foundation, the Asia Network of Women’s Shelters, the Global Network of Women’s Shelters, and the Third World Conference of Women’s Shelters.